It was just a half-day’s drive from her office in Logan, but Karen Mock wasn’t much more than passingly interested in Pando. Not at first. The Utah State University conservation geneticist and molecular ecologist had seen Burton Barnes’ work estimating the clone’s size at 107 acres. It was, she felt, an interesting guess—but not much more than that. “He described Pando based on morphological characteristics—leaf shape, size and all of that—traits that he could look at,” Mock says. That was about as thorough as things got, back in the 1970s. But by the time Mock became interested in aspens, decades later, far more precise means of identification were available. For many years, researchers had known the nation’s western aspen forests were slowly dying. But starting in 2003 in Utah, and later spreading to Colorado and other surrounding states, some scientists had begun to take note of more precipitous die-offs. In some cases, thousands of acres seemed to be disappearing in just a matter of years—all the way down to the roots. The plan was to find a large stand of aspen—one with as many different clones as possible in close proximity—and collect leaf samples for DNA analysis. The collection effort, in itself, was going to be a challenge. “Sometimes the leaves are way bloody up there,” Mock says. So, using small pieces of barbed wire, ice fishing rods—and her bicycle-helmeted children as test casters—Mock and her family practiced fishing for leaves in her backyard. Ultimately, they ditched the rods and barbed wire in favor of slingshots. Meanwhile, Mock and her collaborators had settled on a research site. 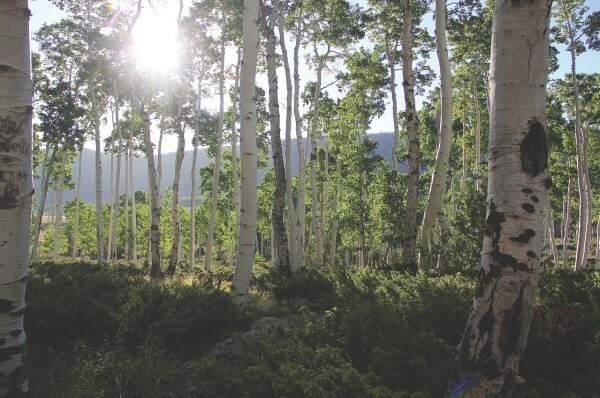 At Swan Flats, less than an hour’s drive up Logan Canyon from her office at Utah State, they found a cluster of more than 800 aspen trees that was thought to comprise a number of clones. That was good enough. They marked off a grid, collected hundreds of leaves from trunks nearest the intersections, and dried them out using kitty litter (the crystal type works best, they learned). Once the leaves were dry, Mock and her team crushed them into a powder and analyzed the DNA. When the data-crunching was done, Mock’s crew had found 200 different clones in the flats. “Up until we started doing this work, we thought that if you found a glob of aspen, most of the time what you were looking at was a single clone,” Mock says. That had affected how people thought about aspen—not as delicate organisms that needed protection, but as giants that could withstand even the most violent challenges of time. Following the steps they’d taken in Swan Flats, then delivering the dried leaf samples for genetic testing at Utah State and the National Forest Genetics Lab in Placerville, Calif., Mock and her team expected to find evidence that would take Pando off the list of the world’s biggest living things. What they found, instead, was that Barnes’ seemingly crude estimates were remarkably prescient. The border he’d drawn around Pando almost perfectly aligned to their genetic findings. Mock had proven that Pando lives—right in time to watch it die.